I remember being a patrol leader in 8th grade and thinking it was the coolest thing ever. Getting to wear a bright orange vest. Holding out a flag with the word STOP on it in the middle of a busy intersection. So that others could cross safely to the other side of the street. Being a leader meant helping, assisting, and serving others. Sadly I was told at an early age that I wasn’t leadership material. As disheartening as that was to hear, it was the catalyst for my obsession with understanding leadership. I’ve read hundreds of books on leadership. I’ve have met, spoke, and interviewed all different types of leaders. I’ve completed various leadership training programs. But I found my answer. Leadership has little to do with a position or title we hold. Leadership has everything to do with the actions and examples we set. It’s not others holding out a flag for me to cross the street because I’m a leader. It’s me holding out a flag for them to cross the street because I’m a leader. It makes sense to me now why the effort I’d give towards one job was so much more than the effort I’d give to another job in years past. The leader who stopped by my desk to ask how I was doing, I always worked my tail off for. The leader who took the time to tell me how much she appreciated my work, I always worked my tail off for. The leader who came in early and stayed late, who cried his eyes out at our company meetings telling us there’s no way the company would be where it is without us (his employees), I always worked my tail off for. I’ve also learned that I can be a leader regardless of my position if I so chose. Whether it’s as a patrol leader, paper boy, McDonald’s employee, personal trainer, life coach, speaker, all positions I’ve been in. 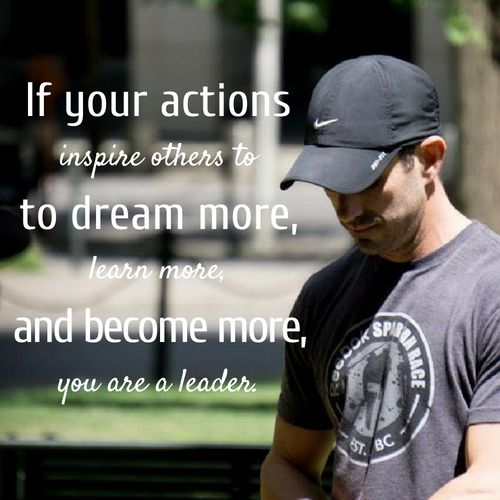 I’m a leader because of my actions and examples. Not because my position or title says I am.